Animal memory surprises us in many ways. 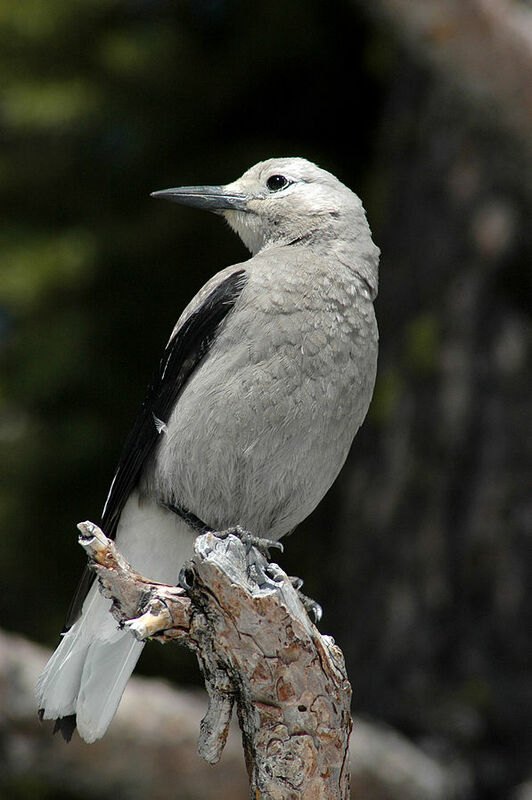 How come, for instance, that Clarck’s nutcracker (pictured) can remember the location of thousands of seeds for many months, but cannot remember the color of a light for more than thirty seconds? To make sense of this and similar pradoxical findings, in a new paper we look at the performance of different species in the delayed matching-to-sample task (DMTS). This somewhat unwieldy name stands for a very simple procedure: we show a sample stimulus for a few seconds, then take it away a wait for a delay. At the end of the delay we show two stimuli: one identical to the sample, the other different. The animal is rewarded (generally, with food) for choosing the stimulus that matches the sample. It turns out that, while a surprising range of species can learn this task equally well when the delay is very short (bees, pigeons, rats, sea lions, apes, dolphins, you name it), most species have remarkably short memory spans. Bees, those microscopic geniuses, can handle at most a few seconds’ delay, while in most birds memory span is in the range from 10 to 20 s. Mammals seem to do a bit better, a minute or so, but because data have been gathered from just a handful of species (we could find 25) we cannot be sure that this difference is reliable. Only pigeons have been extensively studied among birds, and it is perfectly possible that other birds species have memory spans comparable to mammals. What seems clear, however, is that humans can easily remember simple stimuli for much longer times (48 hours is documented, but it’s easy to imagine much longer memory spans, see the paper linked below for a detailed analysis of the data). What have we learned from this review? We suspect that long memory spans are possible in non-human species only in the presence of specific adaptations for remembering specific kinds of information (e.g., food locations). Lacking such an adaptation, even simple stimuli like the colored lights often used in DMTS experiments are hard to remember, and there do not seem to be huge differences between species (at least, across vertebrates). A preprint of the paper is available here.